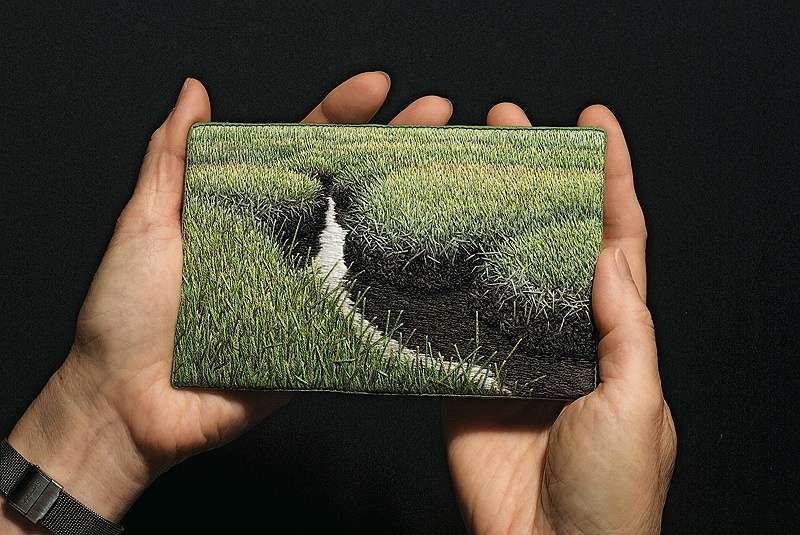 The artist holds Summer Salt Marsh (2008). 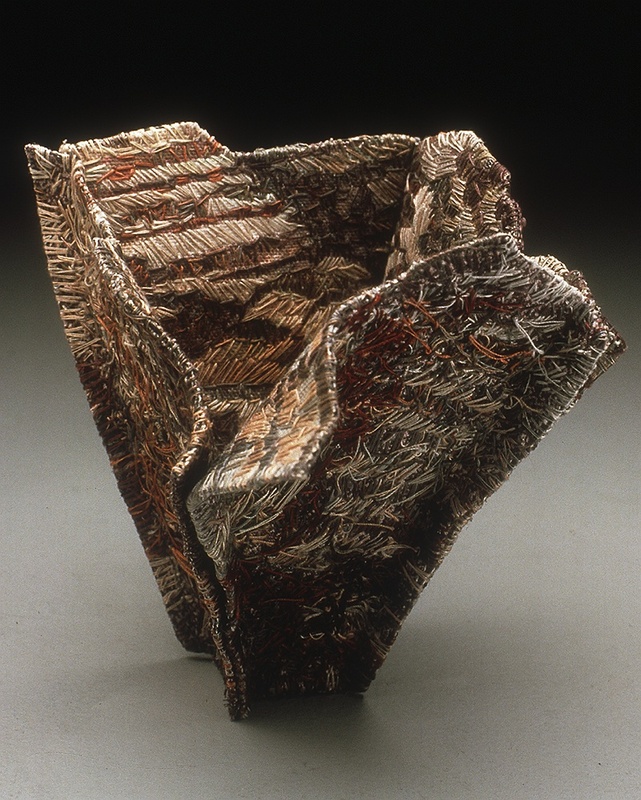 In Quarry (1997), one of Behar's rare "sculptural" works, viewers can see stitching on both inner and outer surfaces. A serious photographer since her high-school days in Northern California, Behar starts with a vivid image. “It has taken me all these years to realize that if I want to do a good embroidery, it has to be based on a good photograph,” she explains. 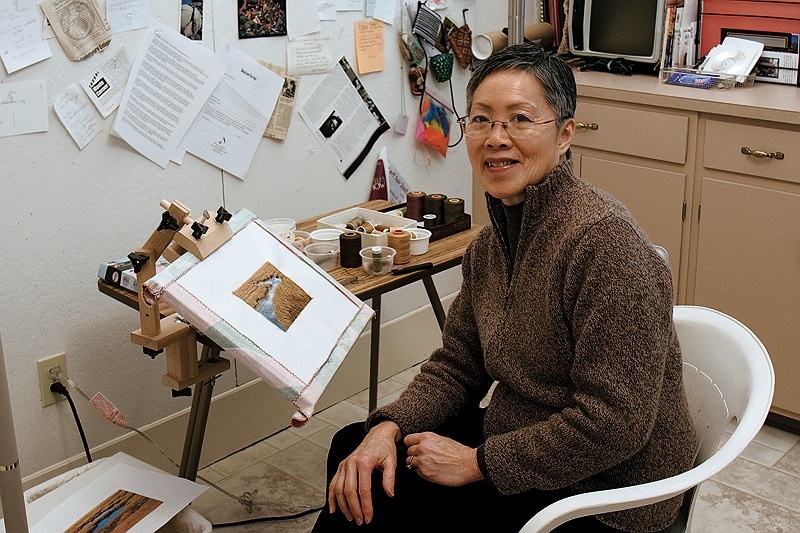 With the salt marshes, for example (she has done 18 salt-marsh embroideries since 1997, each from a different image), “I had to consider the time of day, lighting conditions, the weather, the tides,” she says. “It’s making a photograph, not taking a photograph.” Sometimes, she manipulates the image digitally. The next step is to stiffen the white fabric by sticking it to contact paper, which allows her to print a color photo image onto it with an ink-jet printer. She uses inks containing pigments, not water-soluble dyes. “Unlike dyes, these pigments don’t run when they get wet, or fade over time,” she explains. 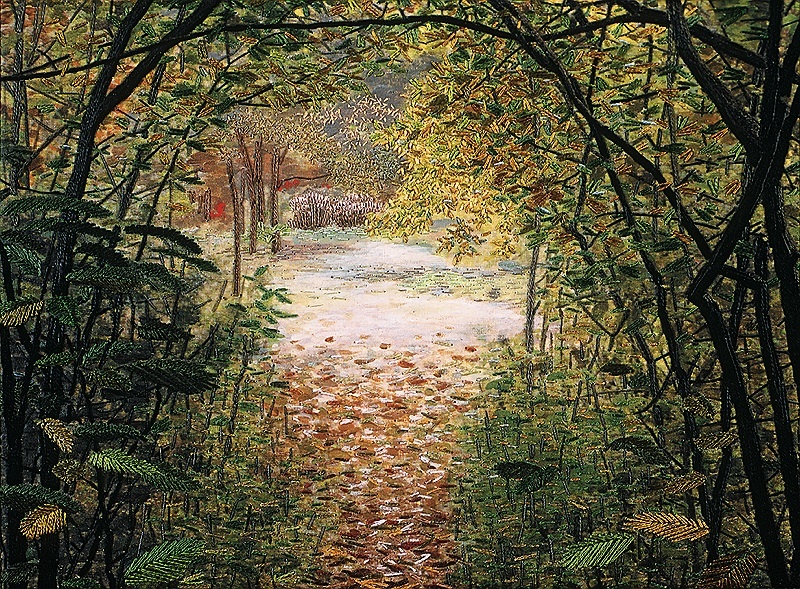 After removing the adhesive paper, Behar typically stitches one or more layers of appropriately colored thread onto the image, initially by using a computer-controlled sewing machine. Behar created her hybrid art form on her own, though it grew from experiences with a variety of visual media. At Radcliffe, she was a staff photographer for the Harvard Yearbook and sold photographs to the Radcliffe News Office for five dollars apiece. She concentrated in architectural sciences, “the only visual major Harvard offered,” she says. “It was the only place where you could get your hands dirty and make things.” As a senior, she took a graphic design course and “realized I had been doing that all along,” she recalls. After college, she worked for several years as a graphic designer at a downtown Boston firm. She married Ken Behar, and became a full-time mother when Katherine, the first of her two children, was born. Behar took up quilting in 1983, when her son, Jonathan, was small, and soon her abstract/contemporary design quilts were appearing in shows, books, and magazines. “Quilts were in the air, beginning in the late 1970s,” Behar says. “The  Bicentennial brought antique quilts to the forefront, and soon people were using the old techniques for new purposes. I really enjoyed working with fabric and thread.” A 1992 trip to Arizona with “a lot of visual input” inspired her to create a fabric memento in the form of a postcard, using appliqué with a little stitching on top. Before long, the stitching grew in importance, and she had begun creating her postcard-sized embroideries.